The main trail there is 4 miles of gravel. It’s not horribly nasty, large-chunk chipped limestone, but a finer gravel that you can ride a bicycle on (and people do). But it is still excellent exercise for the feet. It’s a challenge, but it’s not an unreachable goal. Aside from laziness (I haven’t felt like driving farther to, let’s say, Hocking Hill, and this park is pretty close to my home), I’m also doing this trying to better condition my soles to rougher terrain. I was a bit disappointed last year when I went to Yellowstone (and other western locations) that I had to resort, on occasion, to footwear. The thing is, it takes a lot of effort to duplicate the day-after-day hikes that one does on such a vacation. Well, I’ll be heading out west again later this summer, and I’d like to try to get my feet a bit more ready for the experience, so that I can really enjoy it. Hence, the walks along this particular trail at Blacklick Woods. I’ve been managing to go there maybe 2-3 times a week, sometimes a few days in a row. And it is a challenge. There are parts of the trail where there is an even finer gravel along the edge, but then as you move towards the middle, it gets quite a bit coarser. So I choose what seems to work for me at the time. But by the end of the walk (again, 4 miles over various grades of gravel), my feet are feeling it. I get that Fat Feet feeling. I’d been progressing, but it seemed to go pretty slowly. One day I even managed to run about 1½ miles of the path. 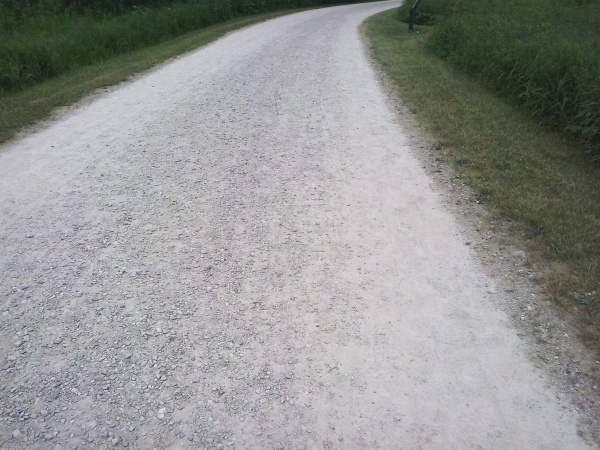 You can get a feel for what the trail looks like and how the gravel is spread. So anyways, I went to Blacklick Woods again. And it seems as if they’d groomed to trails to remove most of the rough gravel. My feet loved it. I tried avoiding the fine gravel on the edges to give my feet more stimulation, but even the stuff in the middle was, dare I say it, almost delightful to walk on. Of course, they hadn’t groomed the gravel. Here’s a picture from today. Looks pretty much the same. That week and a half of relative inactivity didn’t stop my soles from continuing to build up and adapt. As far as I can tell, it keeps happening after weeks of inactivity. I also noticed it after I returned from my Yellowstone trip last year (though, of course, I wasn’t deliberately walking on gravel after I got back). But I did notice that even walking around the house or down the driveway felt particularly cushy. It is quite interesting to see, and feel, just how much feet can and do adapt to their environment. They build up nicely just like any other part of the body that is firmly exercised. And I am hoping that pays off for me later this summer. I did a lot of hiking on gravel roads my first year barefoot. I developed thick calluses on my soles and it really felt weird – I didn’t like it. It was a deadening feeling. About three weeks after my last gravel hike of the season the sidewalks were wet and my calluses came off in strips. I haven’t had the kind of toughening experiences with gravel that you have. Maybe because I was overdoing it. Anyway, I hope this toughening helps with your next expedition. To tell you the truth, I rather enjoy the feeling of the extra padding. It’s also probably “natural”, in that our remote barefoot ancestors evolved that way. I don’t perceive a deadening feeling, but concede that I may be fooling myself. That said, all I can say is that it works for me. YMMV. Side note: I’ve been keeping up with the Flexitol (foot cream with urea) and have not experienced cracking. It probably varies a lot from person to person. I guess I’m really thin skinned so my calluses might be thicker. Bob – nice to hear you’re heading back out west. Looking forward to some more of your great trip reports; I always enjoy them. Without knowing where you’re going, I would like to recommend Arches National Park in Utah. Fantastic scenery and some pretty challenging hikes. It was a bit of a lark. I realized that the date for reserving a campsite at Phantom Ranch was coming up and though, let’s see if I can get one. And I did. So, I’ve built a trip around that. (But that also means I’m pretty much staying south.) And then I had to add Chaco Canyon, but since I’d get there late and didn’t know if I’d get a campsite, I looked around and added El Malpais at the start. (Found out I didn’t need to, since Chaco added campsite reservations since the last time I was there.) But El Malpais looks fascinating (lava-hiking!) so I’ve kept it in the inventory. And then a fellow hiker around here told me about Canyons of the Ancients, so that’s after the Grand Canyon. And I thought I’d finish up by climbing a few (or maybe just one, depending on how I’m feeling) 14-thousanders. That’s be Uncompahgre and Wetterhorn near Lake City, CO.
BTW, Hovenweep (the National Monument within Canyons of the Ancients), where I was planning on camping, just sent out a news release saying they would be closing the campground one random day sometime in the future to repave roads. How’s that for making planning difficult. And in a facebook conversation with them they were pretty unsympathetic and unwielding. What a lack of customer service. Heck, if I hadn’t managed to subscribe to their facebook feed, I wouldn’t have even known about it. Can you imagine other folks making plans and then suddenly getting screwed in this manner? You can also see they got pretty pissed at me and refuse to answer me any more. I’m tempted to escalate to their Superintendent, but that may do more harm than good. Bob – I think I’m the person who mentioned Canyons of the Ancients to you. My husband and I were there briefly last fall on a small-group hike (part of a Country Walkers trip) led by archaeologists from the Crow Canyon Archaeological Center (check out their website!). We had time to hike only a small portion of the Sand Canyon trail from the south end, and it whetted our appetite to return. You’ll NOT have problems with crowds there, and there are ruins and scenery that are very much worth your while. But, geez, Hovenweep management sounds impossible to deal with! On a side note, you do know about the Senior Park Pass, don’t you? For folks age 62 and over there’s a $10 pass valid for life to sites run by NPS, BLM, US Forest Service, US Fish & Wildlife, Bureau of Reclamation, and the Army Corps of Engineers. Our closest site that sells them in-person is the Hopewell Culture N.P. in Chillicothe; via mail order or online the price doubles because of handling fees. Yes! Joan, thank you! Your talking about the Canyons of the Ancients was one of the reasons I decided to head back west and visit the place. I was also planning on camping on the Hovenweep side so that I could bushwhack (or sandwhack, or whatever you’d call it out there), noticing that one is required to stay on the trails for the Sand Canyon/Rock Creek Management Area. And the west side does have Hovenweep and Cutthroat Castle and Painted Hand Pueblo and more of the longer trails. Again, Thanks! Yes, I know about the Senior Pass. But I’m not old enough for it yet. Not until July. The other years I did these western trips in late-May/early-June, but this year I am delaying my trip to take advantage of it (and maybe I’ll avoid the horrible heat wave going on right now—115° at Phantom Ranch). One issue I may have is that I have already made campground reservations for Chaco and the Grand Canyon (because that’s what reservations are for—you get them before you use them and while space is available). I was assured that once I got my pass they would issue me a refund of the excess, so we’ll see how that works. Regarding Hovenweep management, all I can figure is that they get so few visitors that they think just randomly closing one day will affect very few people. And meanwhile I’m busy worrying (and I’m a first-class worrywart) about what I would need to do dispersed camping in the area for an evening (and being annoyed at possibly having to do two extra camp set-ups).